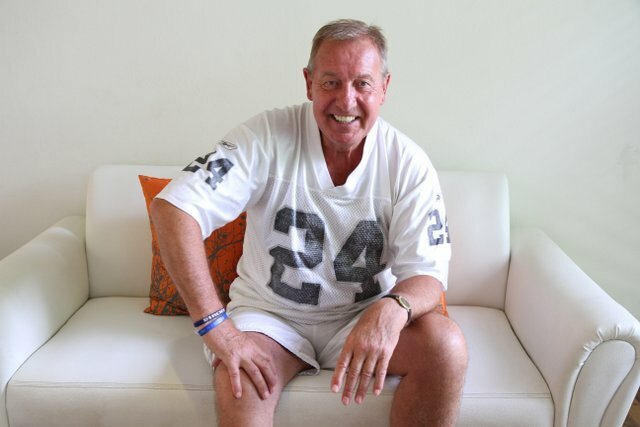 Alan Birchenall having a ‘laugh’ in Phuket. 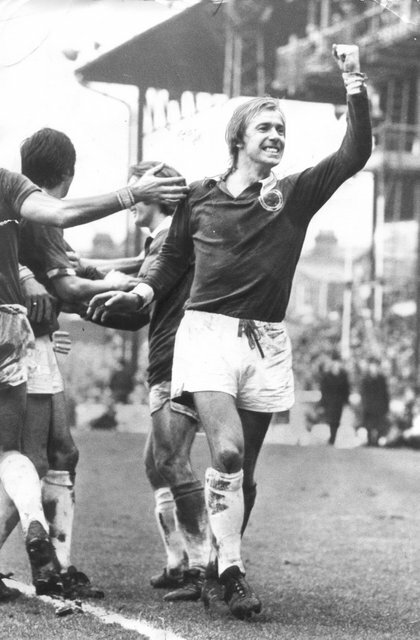 Second photo: Birchenall celebrates scoring a crucial goal for Leicester in the ‘70s. But perhaps Alan Birchenall MBE is just being modest. After all, this wasn’t just any kiss – it was an embrace that challenged popular perceptions of sport, and even had the British prime minister of the time lambasting the decline of English football. Of course, the infamous osculation was just one of many stories the former Chelsea player, and Leicester City legend, shed light on when he was in Phuket recently, as he spilled the beans on some of the highlights – and lowlights – of his eventful career. “The funny thing is that they’re the stories I can’t tell you, the highlights,” he says through a cheeky grin. An attacking midfielder, Birchenall gave up his day job as an engine fitter and started his professional football career with Sheffield United in 1963. He made his league debut a year later, and won the first two of his four England under-23 caps while with the Blades. He had the privilege of playing with, and against, some of the greatest players the world has ever seen – including Best, Pelé and Beckenbauer, to name but a few – but he says the true significance of what he achieved has only sunk in later in life. “When you’re a 20-year-old, you just take it on board. Looking back on it now... and you think ‘these players are legends’. And for all the money and careerism that exists in the modern game, Birchenall still maintains his generation was up there with the best of all time, and he wouldn’t trade it for anything. “People always say, ‘with the money that’s flying around the game today, what we were earning was peanuts.’ I’m not being facetious, of course I’d have liked to have earned the money, but you can’t replace that. “The football today is quicker, and therefore you have to be marginally fitter, but I wouldn’t say it’s any more skillful. Ronaldo or Messi are outstanding footballers, but every team I played against had great players. But Birchenall didn’t exactly do too bad in the money stakes – he was among the first players to command a £100,000 price tag when he moved from Sheffield Utd to Chelsea in November 1967. Leicester City then paid £80,000 for him in 1971, and he remained with them until 1977, before later going on to play for American NASL (precursor of the modern day MLS) sides San Jose Earthquakes and Memphis Rogues. But Birchenall says being offered that kind of money doesn’t change a footballer, even in today’s environment of multi-million dollar players. Yet despite his success on the field, Birchenall says one of the few regrets of his colourful life was never pulling on the national strip, despite captaining the England under-23 side. And he says it was all thanks to a night out in Hungary while on tour with the under-23s. After a few pints, the band started playing ‘Satisfaction’ by the Rolling Stones. After an enthusiastic Mick Jagger rendition, Birchenall says everyone in the bar was cheering for more – everyone except his teammates, who were nowhere to be seen. A report went back, and Birchenall never played for his country again. But despite his solid returns for Chelsea and Leicester, and his moonlighting as a Hungarian cabaret dancer, Birchenall’s playing days have instead been immortalised by one of the more unusual moments in world sport: An innocent exchange between two passionate footballers, and a well-placed photographer with a very long lens and immaculate timing. It was 1974, and Leicester were down 4-0 against Sheffield United. The game was into the dying stages, and Leicester’s Birchenall was running for the ball. He collided with Sheffield player Tony Currie, and both went down. But that fraction of a second, splashed across the front pages of the British tabloids, would be the catalyst for parliamentary debates and scathing newspaper editorials about the state of football in England. Perhaps more amusingly, it catapulted the pair into fame as gay icons across Europe; Birchenall was even approached to write a regular column for a German gay magazine. He declined. Despite not playing for England himself, Birchenall was able to share his thoughts on the Three Lions’ recent performance at the Euro championships, which saw them bow out in the semi-finals after several lacklustre performances. “Predictable. I think we all knew,” he says. “I think the most outstanding team won the tournament, and if anything’s been proved in the last few years is that you’ve got to adjust your game to play football now. You don’t necessarily have to have a big lump up front. “Because we invented the game, let’s don’t be embarrassed by taking [from other countries].” And one country we might be seeing a little more of in England in the foreseeable future is Thailand. Birchenall was visiting these shores as part of his duties as ambassador for Leicester City. In August 2010, the club was bought by a Thai-led consortium fronted by duty-free retailers King Power Group, meaning the club now has strong Southeast Asian ties. Birchenall says the visit to Thailand has opened his eyes to the enormous potential of football in Asia. “What’s surprised me is how passionate it is out here [in Thailand],” he says. “And now I understand why King Power [came in]. As for Thai players in the Premier League: “That time will come,” Birchenall says. Already, players from [Bangkok-based Thai Premier League side] Buriram FC are going over to train with Leicester City. “I can tell you a few of the lads have been very, very impressive, and that’s a massive high level to get in our academy.” He says the progress is evident, and it’s only a matter of time before more serious football is being played in Thailand. But between his overzealous on-field male bonding, playing against Pele, and his lifetime ties with Leicester , Birchenall himself has never taken life too seriously, and therein perhaps lies his greatest success. “In over 500 games, I never came off the pitch without having a laugh, with a supporter, with a referee, a teammate, or whatever.